“The Red Poppy,” the sensational French success, now in its third year in Paris, is the attraction announced for Monday and Tuesday of next week at the Orpheum Theater. From the pen of Andre Picard. the author of “Kiki,” the play deals with life in the Apache quarter of Paris and tells a story that for heart, interest and thrills surpasses anything seen since the days of “The Sporting Duchess” and “The Great Diamond Robbery.” With a Metropolitan cast of 50 selected players, “The Red Poppy” bids fair to create the sensation that “Kiki” has done, although there is no similarity in the two plays. The leading role will be portrayed by Estelle Winwood, who has just closed as the star of “The Rubicon.” Bela Lugosi, a Hungarian actor who is making his first appearance in this country, will play the leading male role. Scenically the production is most pretentious, particularly the second act set of the Apache quarter in Paris. 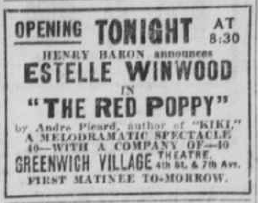 “The Red Poppy,” with Estelle Winwood in the leading role, opens to-night at the Greenwich Village Theater. 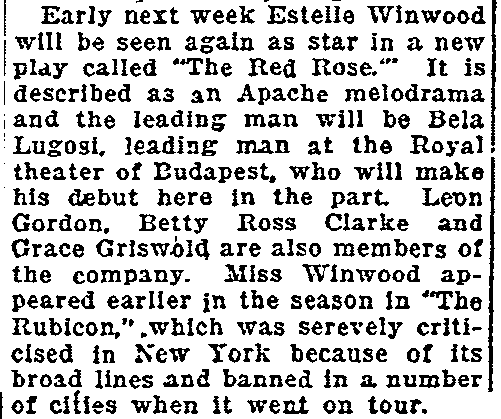 MISS WINWOOD is very interesting in “The Red Poppy,” which is a little more than may be said for the play itself. 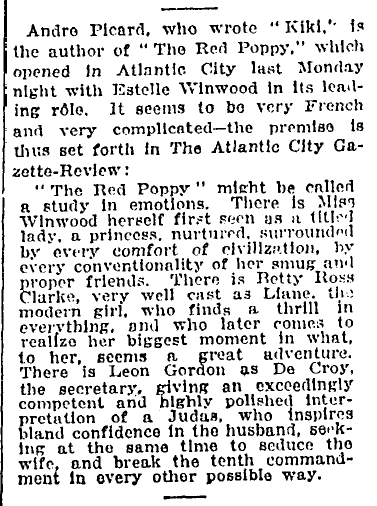 Few actresses can impersonate advanced women so well as she does, and in “The Red Poppy” her opportunities are extensive. As a Princess of Russia, residing in Paris, she is unconventional by birth. 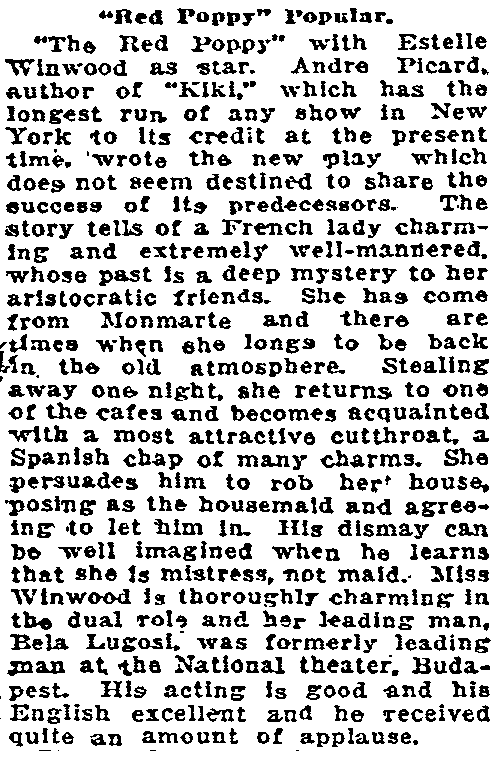 At least she was, before joining the nobility, a slum-wanton, vending herself upon the paves of Montmartre. Therefore, she finds the luxurious existance of the upper classes banal if not altogether irksome. Their “lives are stale, their vices stupid,” and their loves, proper and improper, are not without their insipidities. Since her husband, Prince Sergius, is a bit flea-like in his devotions to her and to others, a sort of neurosis besets her, and she yearns for the dives and lupanars of her merry girlhood. There, she recalls, is where men are men – savage, snarling fellows, who treat their women roughly. She longs for cavernous Apache eyes to glare at her again as in her old cafe days, and to be slapped in the face with a red rose. To be flung upon the floor and cursed while dancing. To kiss a soiled pickpocket full upon his evil mouth, and to regard that caress as heavenly. These rememberances and longings summon the Princess and us in the second act to the Red Poppy, a social rendezvous for the vile and the nefarious. There she meets Spanish Fernando, a worthy cutthroat, wearing a scarlet sash and an air of mystery. They get each into the other’s blood and become all aflame with contacts both fond and brutal. Played as he is by Mr. Bela Lugosi, of the National Theater, Budapest, Fernando submits, we suspect, few reasons for the Princess’ feverish deportment. A tall, sallow, lugubrious and earnest person, with luscious eyes and an accent, he strove last night to please. But we thought him the least likely of all the other criminals present to inspire desperate behaviour in the breast of this or any other naughty Princess. “The Red Poppy” thus proceeds from drawing room to dive and back again, an eventful if not a convincing melodrama. 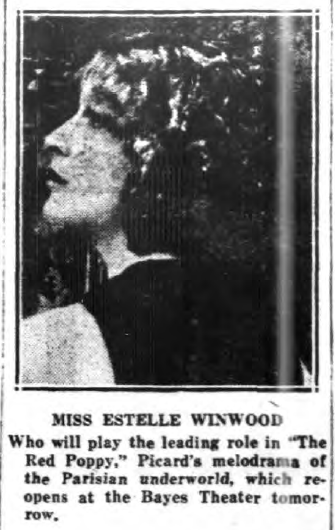 Miss Winwood is coldly patrician as the minor Princess, and hotly gamine as the gutter-girl. She undresses herself enthusiastically in the first act – a detail which we report either as a deterrent from attendance or a lure. We like Miss Clarke’s impersonation of the wondering ingenue whose hair is mussed up in a taxicab by a bad boy from the Rue Pigalle; but that may be because she is so good looking and so intelligently unaffected. 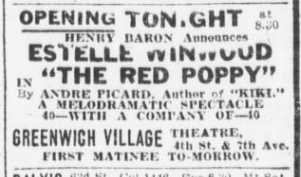 Mr. Leon Gordon, as the Parisian man-about-town, who kills the noble Apache in the last act, plays accurately in the manner of the villain in “Our Nell.” “The Red Poppy” is a show for those whon are not too particular of wehom it is said that they are numerous. 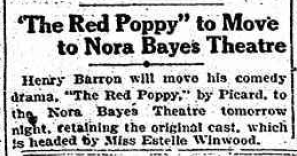 The press carried the following notices that The Red Poppy would open at the Nora Bayes Theater on January 8, 1923. Todate, no evidence has been unearth to show that this actually happened. 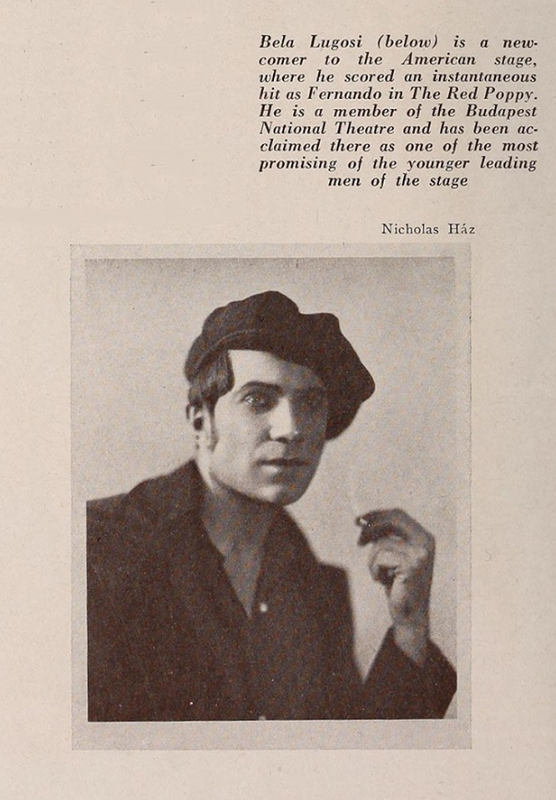 Records of the Nora Bayes Theater show no productions staged between January 7 to March 11, 1923. According to all current sources, only thirteen performances of the play were given at the Greenwich Village Theater during a ten-day run. Financial problems are said to caused the production to fold when the cast were not paid.